One of the best-preserved medieval towns in Europe, the old Bavarian Imperial City of Rothenburg ob der Tauber is considered one of the most attractive towns in Germany. It is also one of the most popular stops on the country's Romantic Road tourist route. Picturesquely positioned on the steep banks of the River Tauber, its walls and towers look much as they did in the 16th century, while many of the buildings inside the walls are even older. Among them is the 13th-century Town Hall (Rathaus); the 14th-century Council Tavern, with its old clock and mechanical figures; and several fine old churches. Half-timbered houses with their characteristic steeply pitched roofs line the narrow stone-paved streets, some housing museums that explore Rothenburg's long and fascinating history. The chief attraction for tourists, though, is the charming old town itself, so spend some time strolling through and walking along its walls. The charming streets and little squares surrounded by well-kept half-timbered houses have made Rothenburg the poster child for Germany's famed Romantic Road, and for Germany itself. So as you wander through the Old Town, its familiar scenes may make you feel as though you'd been here before. Dominating the Marktplatz at its center is the imposing Town Hall (Rathaus), one of the finest in southern Germany. The oldest part of this majestic building, constructed in the 13th century, faces Herrngasse. A later addition is the 16th-century, 50-meter-high tower, from which you'll find views over the Old Town. The section facing the market was constructed in 1578 and includes the fine Imperial Hall, still used for theatrical performances and concerts. Also of interest are the former Council Tavern (Ratstrinkstube), added in 1466, and the old clock with its quaint mechanical figures. Undoubtedly the most picturesque spot in an extremely pretty town, Plönlein looks like something right out of a fairytale book. 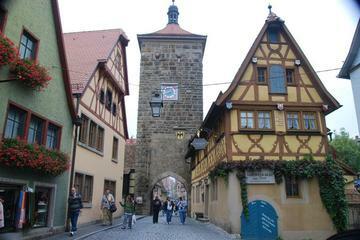 Literally translated as "Little Square," it's really nothing more than an intersection: stand facing the tall, skinny half-timbered building dividing the two streets, and you'll see one of them heads up through the Siebers Tower, while the other slopes down to the Kobolzeller Tower (both towers date from the early 13th century). Just a short stroll from the Town Hall is St. Jacob's Church (Kirchengemeinde St. Jakob). Completed in 1485, it's widely considered to be one of the finest such churches in Germany. Highlights are the Altar of the Holy Blood, a superb wood carving dating from 1505 depicting the Last Supper, and the 700-year-old stained glass in the East Choir.. The Twelve Apostles Altar shows the oldest known representation of Rothenburg. English language guided and audio tours are available. In addition to its fine old architecture, you'll find several lovely parks and gardens in Rothenburg. One of the most popular is the spectacular Castle Gardens (Burggarten). Laid out on the site of a castle destroyed in an earthquake in 1356, the gardens offer wonderful views of the Old Town and the famous Double Bridge farther down the Tauber Valley. Its geometric flower beds, laid out in the 17th and 18th century, include eight sculptures representing the four seasons and the four elements. Other monuments of note are one dedicated to the 14th-century Mayor Toppler and the lords of the old castle, the once dominant Hohenstaufen dynasty. The fascinating Medieval Crime Museum (Mittelalterliches Kriminalmuseum) deals with more than 1,000 years of crime and punishment in Europe, with a particular focus on the medieval period. Highlights include artifacts used to extract confessions and inflict punishment, many of them extremely gruesome, along with fascinating documentation and details pertaining to the often-flawed logic behind their use. Numerous notorious criminal cases are depicted in woodcuts and copper etchings, while another exhibit deals specifically with the terrible witch-hunts that once gripped Bavaria. Rothenburg's Marktplatz is the scene of one of Germany's most popular Christmas markets, a tradition that can be traced to medieval times. But you can experience some of the season's color and traditions all year-round at the Christmas Museum (Deutsches Weihnachtsmuseum). Displays of seasonal decorations and artifacts focus on local traditions in towns like Rothenburg. Highlights include tree ornaments, nativity scenes, and numerous old figurines, including 150 figures of Father Christmas himself. If you can, visit during the lead up to Christmas when the town is festooned with more than 80,000 candles and four kilometers of decorations and lights. Strolling along the Schmiedgasse, a fine old street running south from the Marktplatz, you'll come to No. 3, the Master Builder's House (Baumeisterhaus). This fine old building with its spectacular façade from 1596 is widely considered to be one of the finest Renaissance houses in Bavaria, and was where Rothenburg's Master Builder, Leonard Weidmann, lived and worked. A testament to his skills, the house is famous for its carvings of dragon motifs, along with statues representing the seven cardinal virtues and the seven deadly sins. Constructed between 1395 and 1400, the imposing Klingentor is one of the most architecturally interesting of all Rothenburg's towers. Sitting alongside St. Wolfgang's church, it forms a gate in the town walls. It served another purpose as well, as a water tower, with its huge copper tank feeding the town's fountains. You can climb it for a small fee to see views across the town and Tauber Valley. In the picturesque Spitalhof are a number of interesting buildings worth visiting. In addition to the Hegereiterhäuschen, a fine old home built in 1591, there's the massive 16th-century Spital Gate (Spitaltor), both built by Master Builder Leonhard Weidmann. The last of the town's many fortifications to be constructed, Spitaltor bears the Latin inscription, Pax intrantibus, salus exeuntibus, meaning "Peace to those who enter in, good health to those who leave again." Constructed in the shape of a figure eight, these intimidating fortifications include seven gates, a drawbridge, a portcullis, and a parapet. In a former Dominican convent, Rothenburg's Imperial Town Museum (Reichsstadtmuseum) gives a better understanding of the importance of this beautiful old town. Established in 1936, the museum details life in the convent, which was dissolved in the 16th-century, including a look at the historic living quarters. Other features are the well-preserved, 13th-century kitchen and the 14th-century panels of the Rothenburg Passion. The museum's Judaica Department contains artifacts showcasing the town's Jewish heritage, and the display of European weaponry, from the Stone Age to the 19th century, includes hunting weapons once used by Frederick the Great. Luxury Hotels: A few steps from the Christmas Museum and Burg Garden, Hotel Herrnschloesschen offers guests free breakfast. So does the Hotel Gotisches Haus, a beautifully decorated historic building in the same location. Built into town walls nearby, the Burghotel overlooks the Tauber Valley with spectacular views from its terrace and well-furnished rooms. Mid-Range Hotels: Just outside the walls at the entrance to the old city, Hotel-Garni Hornburg is a beautiful and hospitable manor house with large, nicely furnished rooms. The family-run Hotel Reichsküchenmeister, in a half-timbered house just off the market square in the center of town, has a good traditional restaurant and includes breakfast. In the newer part of town, only a few blocks from Marktplatz on the way from the rail station, the chef-owned Mittermeier Restaurant & Hotel offers guests free parking. The old-fashioned Hotel Eisenhut is in a historic building next to the Christmas Museum and just off Marktplatz. Budget Hotels: Between the Christmas Museum and Burg Garden, Hotel Klosterstueble is in a traditional building with a cozy courtyard and quirky rooms. Antiques furnish the Hotel Spitzweg, on a small quiet street a block off Marktplatz, where hospitable hosts offer free parking, an unusual feature right in the center of town. Near the town gate, a five-minute walk from Marktplatz, Hotel-Gasthof Klingentor has spacious rooms and also includes free parking, along with breakfast. 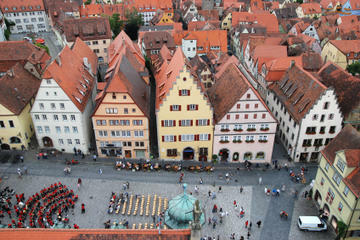 Day Tour from Munich: Rothenburg is a highlight of the Romantic Road, a tourist route through some of Germany's most charming medieval towns. You can follow this route by air-conditioned coach on the Romantic Road, Rothenburg, and Harburg Day Tour from Munich. There's time to stroll through Rothenburg's streets at leisure and discover its historic sights. A bonus of the tour is a stop at the 11th-century Harburg Castle, one of Germany's oldest. Day Tour from Frankfurt: Combine your visits to two of Germany's most popular attractions on the Frankfurt Super Saver: Neuschwanstein Castle and Rothenburg Day Trip, a 24-hour guided excursion by coach. Skip-the-line admission to Neuschwanstein and a professionally guided walking tour of Rothenburg are included, along with round-trip transportation from central Frankfurt.